world suggesting that we should use LESS Special K.
I’ve been reflecting recently on my use of ketamine in the emergency department. Back when I was a registrar I wrote our original protocol for the use of IM ketamine in kids. I think that would have been back in 2001/2002 so roughly about 10 years ago I guess. At that time it was a great step forward particularly in paediatric emergency medicine as we moved on from ‘Brutacaine’ (holding a child down) as a method of achieving painless procedures in children. A dose of 3mg/Kg Ketamine with atropine was fantastic! So what has changed since then? Well, the first thing that changed was the move to IV ketamine. If you’re still using IM ketamine then I would really suggest making the move to IV. Now, some people say that if you’re going to stab them with a needle to get IV access then you might as well just go for IM. I too used to think this, but to be honest the superior control, more rapid onset and offset means that IV really is the way to go so long as…..
You are good at getting IV access in kids. You have great nursing/play therapy support to help you do it. You use EMLA (or equivalent) to facilitate cannulation. Fortunately I have all of these where I work and that makes getting access a fairly straightforward and relatively distress free process. The evidence base is not perfect here with reviews in the literature and on BestBets being inconclusive. However, I’ve used loads of both and if you want my opinion IV is by far the best and it’s our standard of care in Virchester. So IV was the way forward and I guess we started going IV in about 2005/2006. We used 1mg/Kg Ketamine IV with atropine for about a year. It was pretty clear that the atropine was superfluous in the vast majority of cases. Sure, ketamine is known to cause hypersalivation, but it’s rarely (if ever in my experience) a problem and IV atropine is not that pleasant. If you are going IV then you can always give it later if you get a problem so routine administration is arguably unnecessary and a BestBet on the subject backed this up. So in the early days we used to draw the atropine up, but never gave it. These days I just check we have it in the cupboard should it be required, but I don’t draw it up into a syringe. We were pretty slick to be honest. Ketamine sedations were common in the ED and our consultants and trainees became competent (and confident) in its use. A few months ago I was running through the portfolios of our trainees and it became clear that they were struggling to get signed off as competent in Ketamine sedation and this was primarily due to exposure. Many of our ketamine sedations were historically being done to facilitate wound care, cleaning and suturing usually. We’re just not doing it as much as we did and the culprit is LAT gel. Now LAT gel has been around for ages. Data on its effectiveness has been in the literature since the 90’s (and TAC was around before that) but we did not start using it in the UK until roughly 2009/2010. Basically a mixture of lidocaine, adrenaline and tetracaine it is applied as a gel into the wound and left for 20-30 minutes. I love it for many reasons, but pharmacologically the top two are…. It shows you where it has worked because the skin blanches (due to the adrenaline) . So an effective agent that tells you where it is has worked = marvellous! In practice this means that we are doing far fewer ketamine sedations than we were a few years ago as the group of patients tolerant of wound care under LAT gel has increased. Initially we were wary of using it in young children (the 2-6 year olds who aren’t that easy to rationalise with), but in reality they are often the group who do fantastically well with a bit of a cuddle, a book to read, and if you need really powerful medications – BUBBLES. So, if you’re not using LAT gel you may well be exposing children to anaesthetics, pain or sedation that they just don’t need, and that cannot be good. I will happily support anyone who wants to put it into their practice. Read the literature, show them the blog, drop me a line – whatever. I want to know that if I turn up in your ED with my kids that it’s on your formulary as it’s what I would want for them. Still have doubts? That’s fine, before I completely convince you let’s run through a few FAQs that might have cropped up in your mind…..
OK – I get Ketamine – what about LAT gel? Having seen both methods – which would you want to try first for your kid? Wound care is not just about pain – what about distress? You’re absolutely right of course. The management of children in the ED is about managing distress just as much as it is about pain – and the two are really quite different. Whilst LAT gel will reduce pain it cannot help you if a child is scared, distressed and uncooperative, in those circumstances you will need sedation to facilitate wound care (or whatever). It is wise to apply Jenner’s rule here (named after one of my superstar colleagues). Jenner’s rule states.. ‘If the child allows you to put LAT gel on without distress they will let you suture them’ and conversely ‘If the child screams like a banshee when you go anywhere near them, then you’ll need more than LAT gel! What age groups can you use it in? We don’t recommend below the age of 12 months to be honest. This is partly a safety issue as you need to be careful in the youngsters, but also because it’s very rare that you would need to do suturing in the ED at this age (what the hell happened to get a wound needing ED suturing you should be asking). At an age of 1 year you only have 1ml of LAT gel to use (assuming 10Kg) child so there are limits to what can be achieved, and there are other practical issues such as whether they are going to be able to stay still with distraction. You can of course use it in adults as well, but as it’s more expensive it tends not to be done in practice. Is there a limit in terms of wound size? We say up to 8cm, but the dosage also limits the size of wound. In small kids you can only use a small amount, so obviously you can only use it on small wounds. Finally, a personal plea. If you’re not currently using LAT gel and this post changes that then please, please, please let me know.If you are using it and agree with me, let me know. If you think I’m talking rubbish, let me know. It would FOAMtastic if this made a difference. We aspire to a pain free ED. This is one of the tools on that journey and I hope that you embrace it. You and your patients will be grateful if you do. Very interesting topic. Do you think we can use it also in adults for example in abscess incision and deainage? You can certainly use it in adults, but it does not go through skin. You need a laceration or skin breach to allow the drugs to enter the tissues. As a result it would not work for an abscess, plus you would still have the problem of anaesthetics working poorly in inflamed tissue. Hi Simon….I absolutely second your post…..our Paediatric Ketamine sedations have decreased owing, in particular, to LAT. This is concerning as ‘Ketamine sedation’ is on our core curriculum for trainees. Secret to success with LAT: Play Specialists (which most units cannot afford 🙁 ! I’d like to know if anyone in Australia is using LAT gel, as I’ve never seen it in our ED. Maybe under another name? Available as Laceraine here is Aus. Are many departments using it? thanks for your reply. To manage patients with skin abscesses getting the procedure less unconfortable and painful is not an easy thing to do. I have had good results using circumferential injection of anestetics. The pazient feels a lit bit unconfortable but he is not completely pain free. Do you use Ketamine in this setting too or something like midazolam plus fentanil? I have used circumferential injection of local as well but patients can find the injection painful. I try and infiltrate the dome of an abscess S/C with local, you can see the surrounding skin blanching as it spreads out. See P724 Roberts & Hedges 4th Edition for a fuller explanation. Same experience as you Carlo. I have used a variety of techniques for abscess incisions. 5. My personal favourite for the big ones and when in tiger country (neck, groin, axilla) – refer to surgeons! Brilliant post Prof, many thanks. Timely for me, as I was moaning about the lack of LAT gel our department just the other day. While I agree with the impact on training (I performed far fewer ketamine sedations in PED than I do at a general department), avoiding sedation if possible is clearly better for patients. I have sen two patients ketamined recently that I think would have managed fine with LAT gel…. I will be forwarding this link to those in charge! Don’t see (as Simon says) why it should be restricted to children. Hi, could I ask you who makes your LAT gel? There’s an interest in the department and I’d like to get a rep to come and talk to us about it (and bring lunch for middle grade teaching). Also, probably a dumb question, but all the location restrictions that apply to adrenaline also apply to LAT gel I presume? I’m loving St Emyln’s btw, great site. Link to Torquay pharmacy is on the blog post (last window to open). No reps as such as direct from their pharmacy. We use the same restrictions in terms of site as we do for adrenaline. So we avoid tips of anything. Not sure if it’s necessary but seems to be sensible at this time. Just heard today there is a Nationwide shortage of 100 mg/ml ketamine…new stocks not expected I think until 2013 autumn (though maybe 2014). Option is to go IV…unless anyone can tip me off to generic ketamine being produced (for legal NHS use). I understand Doncaster Pharmaceuticals make Ketanest-S but 25 mg/ml is the strongest solution. BTW submitted LAT gel to D&T committee so hopefully get the chance to use it. We’ve gone over to IV ketamine so use 10mg/Kg solution. Higher concentration only really used if you are still going IM. Maybe this is a nudge to change to IV…..
Nasal ketamine is pretty sweet. I would apply Jenner’s rule. If the kid lets you put the lat gel on them without making a fuss then you will be fine. If they scream and shout when trying to put the topical anaesthetic then they will not tolerate the procedure later (so go straight to procedural sedation). I would say that we use it more & more. In a specific kids dept. (I work adults and kids) it’s really well set up for distraction, play therapists etc. it makes all the difference. Here here on the comment above, its true if you can apply ametop or emla without much fuss you can certainly apply LAT gel. Explain it right to the child and even the youngest of children will let you “make it all better” or “put them back together like humpty dumpty”. Thanks Amy, you are of course right, and I’ll add another shout out for the nurses and play therapists of the ED. They are absolutely key to making this work. Simon for dose do you mean 0.1 ml/kg? Because o.1 mg/kg of lidocaine would be tiny. Just writing the protocol for Leeds. 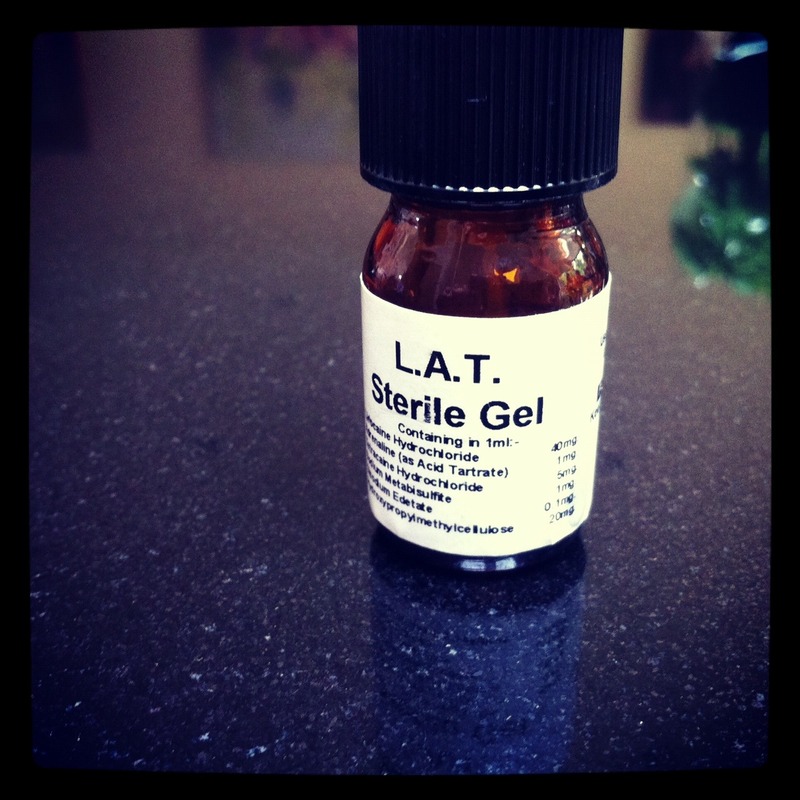 Great to hear that Andy is now using LAT Gel in Leeds. Have seen some folk infiltrate wound edges with lignocaine after LAT gel, whilst others go straight to suturing without additional local. Do you find that LAT gel is enough? I have never had to infiltrate with lignocaine after LAT gel. I would certainly not do it routinely. One of the advantages is that you don’t ‘swell’ the tissues by injection when using LAT gel. That allows an easier and possibly more accurate closure. So, no, local infiltration is not needed in my experience and arguably it removes one of the advantages. I have used TAC +++ previously. When I brought it up at the ucc I sometimes work at they (the managers) were worried about abuse and clearly freaked out by the cocaine angle. I was unaware of LAT. I will certainly be revisiting this with them. Many thanks indeed. Just read this Simon and have to confess – I had forgotten since leaving the NW that LAT gel even existed. Having had some rather disheartening ketamine experiences recently this has reminded me of something so simple. Are you using K IM or IV. I became disheartened with IM but love IV. IM too difficult to titrate to effect etc. Just to answer Tamara Hills question – Laceraine is used in quite a few hospitals I know of across the 2 states I’ve worked (QLD and Vic). I also use it to decrease the amount of ketamine needed for sedation. Thanks for the lovely summary of all things non distressing in paediatric wound management. I looked at doing my CTR on the impact on play specialists and the need for admission / GA for wound management, but a) there was no evidence and b) I was told my PED consultant that demonstrating such a fact would result in losing the trust money (despite saving the NHS loads!) so wouldn’t ever make a business case! Great stuff. Andy Webster in Leeds put a business case through for LAT gel recently so may be worth getting in touch. Good luck with the CTR and get in touch direct if there is anything else we can do to help.